A Safety Certificate, otherwise known as a Roadworthy Certificate, is a document required when transferring or registering a vehicle in Queensland. This includes registering a vehicle in QLD from another state. A roadworthy certificate (RWC) requires a series of checks to be carried out by certified inspectors. Meet the Gold Coasts' top Roadworthy Certificate providers as voted by AutoGuru customers. Magic Spanners have been listed on AutoGuru for over 2 years and boast a 4.9 star rating from 51 customer reviews. 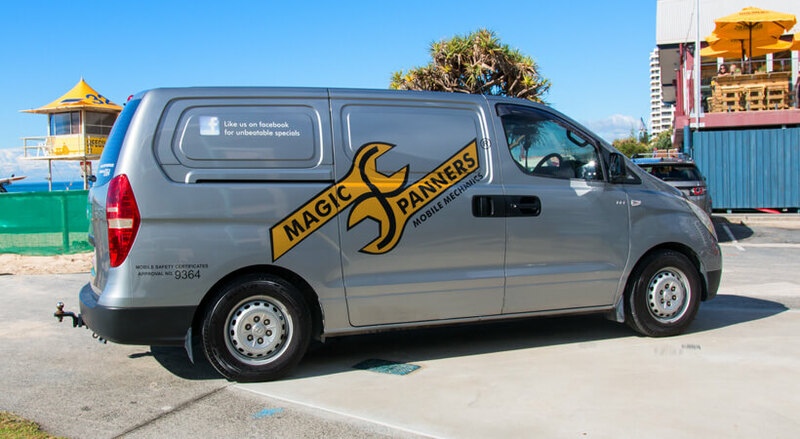 Magic Spanners offer Roadworthy Inspections/Pink Slips at the convenience of your home or office, and also offer a range of other services such as air conditioning, auto electrics, engine diagnostics and car servicing. If you need a Roadworthy fast, book online now at AutoGuru. Get a $99 Mobile Safety Certificate with Magic Spanners - limited time only! Ozsome Auto Centre provide Roadworthy Certificates to Burleigh and surrounding suburbs. And if there's anything preventing a RWC from being issued, the team at Ozsome can also service and repair all makes and models. From basic and logbook servicing, brakes and clutches, to auto electrical, suspension, fuel and cooling systems, power steering, and more, they can get your vehicle up to standard. Varsity Lakes Mechanical is a family-run business, with Tom as the mechanic and wife Bec in the office, assisted by young sons Noah and Flynn. With a 22 year history in the automotive industry and a reputation for trustworthiness, this family business prides itself on running a friendly, clean workshop. RWCs are just one of their capabilities and they're happy to answer any questions you have regarding their work. With 15 years experience servicing all makes and models, Pine Ridge Autos in Coombabah, carry out Roadworthy inspections and issue Certificates as part of their comprehensive automotive services offering. They have built a reputation for quality car servicing and mechanical repairs for all makes and models, and all repairs carry a warranty. Results recorded on 11th July, 2016.